This turned out to be FAR better than what I thought it could be! Especially the art, writing coming in at a close 2nd. Amazing to see what people can do in such a short time. As a Yuri lover, this VN was more than a welcome gift! Awesome work, through and through! Thank you! wonderful music! even short story i wish there is continuation of their story ahh!! A really pleasant story that's being told in the perfect amount of time, being neither dragged out or feels cut-short. The artwork is a nice mix of clear characters and mystical backgrounds. Hope to see more like this from the team in the future! I love this game so much. A lot of yuri visual novels I read tend to be very boring and dry but this one is a sweet romantic adventure with some good action and a natural development of romance between the characters. It;s short and I wished it was longer but I also think it ended perfectly as well. Good job :D I hope you guys do more. Such a wonderful kinetic novel! I'm not much of a fan of kinetic novels, but this one really nailed it home to me. It bundled up all the things I love- fantasy, yuri, emotion, and combat into one short but wonderful story. I loved it lots- and I'd really recommend anyone to give it a try. I loved the music choice, which, while the transition between each track wasn't perfect, it still helped convey the sort of emotions you were supposed to feel during each scene. It's hard to make me cry, but somehow the ending really managed to make me do so. The art is also beautiful, and it's hard to see how such good art could be produced within the short timespan that the Yuri Jam allows for. If these authors make any more visual novels or such with yuri content, I'd definitely want to see them. This was a wonderful eye-opening experience that I really loved, and to this day I'm still occasionally replaying certain scenes just to relive said experience. 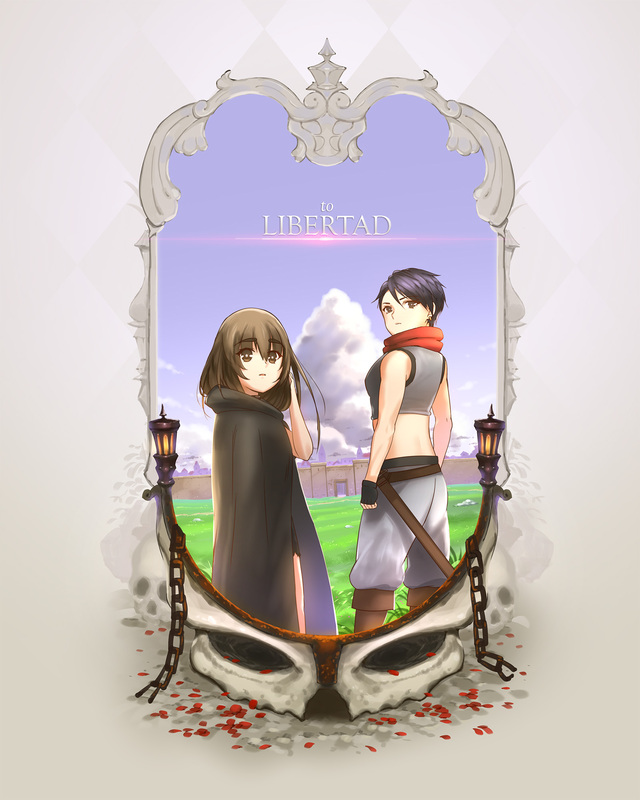 In the end, thank you, developers of To Libertad, for making such a masterpiece! It'll be in my heart for years to come! A really great VN! Probably a best free short VN a had read. Are you guys working on any other VNs? I can't seem to find much on your group, is there any place I can fallow your work? Also since you say you appreciate a feedback I might mention one minor complained, when Ada and Martha talk after they had escaped from goblins and Martha asks Ada if she isn't interested in man everything was going in direction that Ada is interested in woman and what actually turned up to be a case really seemed out of place for me, maybe it is just because I knew it is a yurijam game so I fully expected it to be yuri so when Ada says she was interested in man it was really disappointing for me. Aside from this there might had been a few other lines that I thought ware a bit out of place like when Martha fought an ogre and says she has to slay it because if she doesn't he will continue to kill innocent bypassers seemed out of character, especially since the primary reason she was fighting ogre was to bay time for Ada to escape so I thought that something along the lines of she has to fight an ogre to buy Ada time would be more fit there, but those are mostly supper minor complaints and the only one witch was pretty disappointing was the first one. Still a great VN, I hope to see more from you. Hey, this is cool! Did you want me to add this to the official release? Feel free to talk to me through e-mail. Either way, thanks for doing this. I talked to the author of the translation, he said "Do with it what you want, my permission is not required because all of my content originally published either under Public Domain or under CC0. Here just let Sendo takes into account that I'm certainly not going to process your script in the translation =D" if literally to write what he said. ...Also, you did not make this in four weeks. Original music, writing and artwork this polished? I call shenanigans. And if not, what the heck am I doing here? I need to get out there, see the world, make things! But in the mean time, the best of luck to your future work. I believe the art was done in 4 weeks, though some may have been polished or added post-release (since it's up to version 1.11). The writing was more like 1 week, IIRC. Not sure how long the translation took. Music was creative commons (at least originally, might have been replaced), so who knows when that was done or how long it took. So yeah, mostly done within 4 weeks. Sendo worked tirelessly on this one, and I think it really shows. As Zetsubou said, the music used were Creative Commons so I simply picked out songs that matched the scenes. I added some illustrations I did outside the jam in the Extras section, specifically in the MISC gallery. But aside from those, everything in the actual story (art, writing, programming) were done during the jam. I do have experience making games and participating in game jams so that really helped me manage everything. And well, Zetsubou blasted through the script so I had to up my game as well. But really, I was pretty much just working on it day and night. It was a fulfilling experience and I wouldn't have it any other way! That was beautiful and heartwarming and wonderful. Thank you. I don't know how I overlooked this on my first pass over the list of games in the jam, but I'm glad I found it. I really enjoy yuri games with these kinds of... carefree but serious low fantasy? settings, and seeing stories like this from perspectives other than the obvious RPG heroine's is nice. I don't even mind that a quarter of the game is probably Martha sharing her perspective on the daily realities of adventuring, because it was interesting. I think criticizing it based on its length or linearity would be really a bit unfair. It was as long as it needed to be to tell the story it was trying to tell. It didn't drag on (though I'm sure I would have still enjoyed it a lot if it was twice the length), and it didn't feel like it was rushing too fast. I'm fine with it being a kinetic novel, too - it means I don't have to feel regret over choices not made, and within the scope of this story, I don't think anything I could have chosen to do would have made the ending any more perfect. There was one point when I felt the music choice was slightly strange: the cheerful market music carries on while Ada's talking about not even knowing her age. Admittedly, changing it might break the flow of the scene... The music otherwise fits pretty perfectly. I'm going to be following you, because I really want to see what else you make, if it's anything like this. I hope to see many more yuri games from you in the future. I loved this VN!! It's so good I feel like tearing up a little now that it's over. :( More yuri VNs should be like this! The story didn't skip away a budding romance between two women, and the fact that Martha was such a non-girly bad*ss was a huge plus. Take notes ya'll! Also, thanks for making this! I guess it will be for a next time. I'll keep waiting and watching (following) till then. MOAR please, and thank you very much! I definitely plan to do longer projects that has choices, so please stay tuned for that. Hi, please ignore the previous poster. Feel free to send feedback or any concerns to sendogfx@gmail.com. Sexuality isn't that simple, I used to think I'm straight but after a bunch of years turns out I'm a lesbian. It is that simple. If people could in any way change sexuality then back in the days when gay people will persecuted, no one would have ever been gay. Also there is no way I would have been gay. People can have pretty strong ideas about what they think they are. I realised that mine was false the whole time. You're completely misunderstanding me. I didn't just stop being straight at some point because I decided. I just learned afterwards that I was a lesbian. It was not my choice, it just happened. People can also have pretty strong ideas about what they think, I hope you can learn that yours is false in this too. I know many people that have had their sexual orientation their entire lives and I have never heard of anyone's changing. Since there is no proof for either case it seems we have to agree to disagree. - I'm also going to delete the original post soon because i don't want to turn this game page into an argument. Oh I see. It looks like you were the one misunderstanding me the whole time. My opening statement was how the game made it seem the girl was MADE to change. I was never talking about changing without cause.